Writer’s Note: This review is best read aloud in a fake British accent or a real one if you happen to actually be British. I am quite the fool for a good period drama where a roomful of young women flutter about making high-pitched, inaudible noises at the announcement of a new male prospect coming to town. Mothers trying desperately to marry off their daughters into good homes or even better, rich homes, that will in turn provide the rest of the family with security and stature. Women who only speak in turn and do what they’re told. I jest. Besides, you don’t find these women in these movies any more. Modern period pieces are more concerned with disproving how proper people were. Less women sitting daintily and more women picking their noses. Joe Wright’s PRIDE & PREJUDICE was exactly what I wanted. It is both beautiful and engaging, a challenging yet light-hearted romance. It was everything I needed to help erase the memory of the Bollywood Musical remake, BRIDE & PREJUDICE, I painfully sat through earlier this year. This being yet another interpretation of a famous Jane Austen novel, I certainly needn’t rehash the story for you; I’m sure you know what to expect. Kiera Knightley plays Miss Elizabeth Bennet, the second eldest daughter of five Bennet’s. She does not have any particular talents or ambitions that would differentiate her from her siblings. She is simply not interested in losing her head over whether or not she gets married. Miss Elizabeth would rather be alone than be with someone for convenience sake. That maturity, that knowledge that there are more important things in life, gives her a peaceful glow that is only shaken when her independence is threatened by a marriage proposal that will undoubtedly end in a loveless existence. Of course, there is still some fear in her that she will never find another to love but she braves on. After all, she does have her pride. 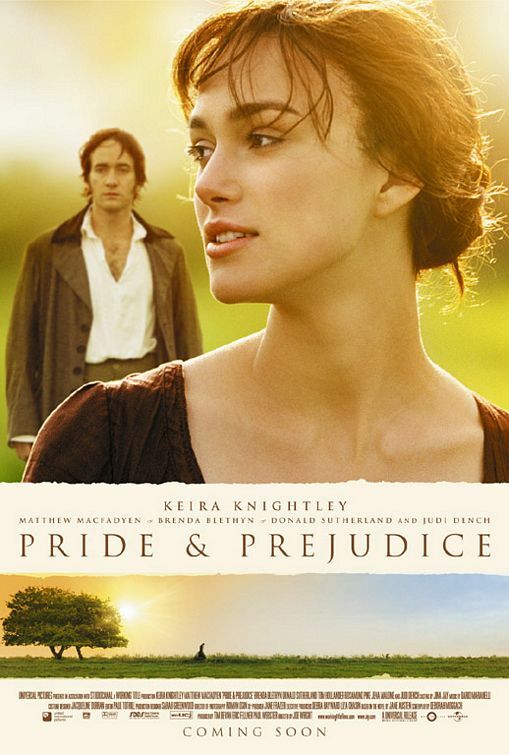 Matthew MacFadyen plays Mr. Darcy, good friend to Mr. Bingley (Simon Woods) who is interested in marrying Miss Elizabeth’s older sister, Miss Jane Bennet (Rosamund Pike). He broods and skulks but we are still intrigued as he has such beautiful eyes. These are eyes that suggest something more sensitive beneath this brutish façade. Mr. Darcy is well intentioned but has yet to master the art of human interaction, as is quite clearly shown as he flexes his fingers awkwardly after touching Miss Elizabeth’s hand. For her, it is a simple touch; for him however, a vulnerable revelation that he has likely never been loved nor allowed himself to love. Remaining safe in his tower above the commoners has shaped for him many a prejudice. “Pride” and “Prejudice” meet on the dance floor when Mr. Darcy unexpectedly asks Miss Elizabeth to dance. When the dance first begins, the conversation between the two is cold, guarded and expressed in the third person. It is aggressive, confrontational even. They are both angry that the other’s existence remains with them when they are apart. As it continues though, they cannot deny their chemistry as the dance flows naturally until the end nears, and there is no one left in the ballroom but these two. Fight all you like but you cannot will love away and that is a lesson that you must let go of both your prejudices and your pride before you can learn it.